When my son Chad called me and said "mom we got to make a fruit-filled tropical style quick bread with everything we both like in it" I said ok what did you have in mind. He just loves blueberries in everything. He said " let's make your banana bread recipe with both our favorites in them, you love coconut and cherries and I love bananas and blueberries. So that's how this one was created. Here is my first born son Chad's adapted tropical banana, coconut, blueberry bread. Chad is the dessert lover in the family and this was a great change in the recipe for the best everyday banana bread! This made two 9 inch loaves, one survived around an hour the other went home with him. Thanks, Chad for this great adaption and with the next generation of innovative bakers this one a keeper for me too! My son chad loves to experiment on different ingredients. He isn't a fan of any kind of nuts in the bread. There is so much batter, you can easily make two small loaves and both accommodate anyone else in the home that loves nuts. You could also omit the coconut or blueberries and add chocolate chips. Needless to say, you can add whatever you like and get very creative with this basic banana bread batter. He really loves the blueberries but also has added chopped diced pieces of apples and cinnamon in the batter as well. 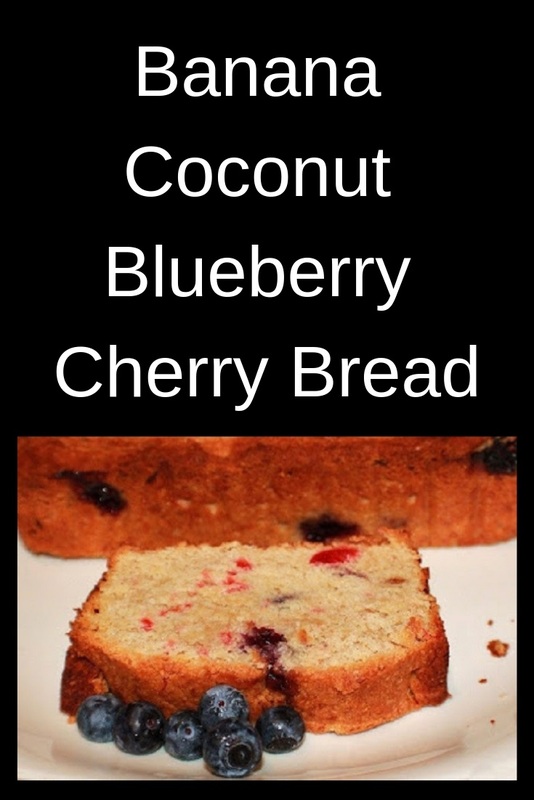 This quick bread is great for dessert, it travels well and perfect for after school snacks. Since it's so full of fruits, I pretend it's very healthy! The kids really love this bread of all ages! The traditional pan to use for any quick breads like this banana bread is a loaf pan. I have used mini loaf pans, square pans, brownie pans, and cupcake tins. There is no right or wrong pan, just baking will take more or less time, depending on the vessels you choose. If you decide you want to use a metal coffee can, the time will increase immensely. Just remember to do that toothpick test in the middle, if it comes out clean its done! If you make this in a sheet cake pan, dust with powdered sugar or a thin frosting if desired. 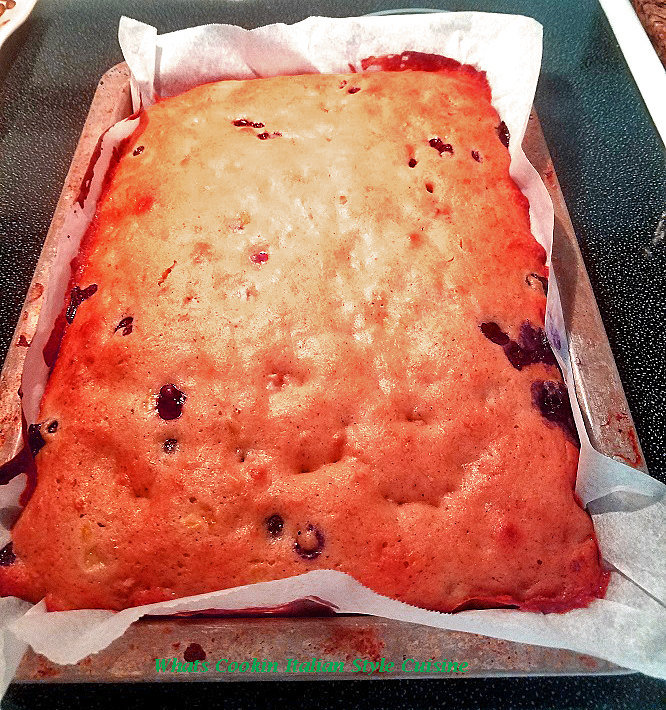 This is a banana bread adapted to have coconut and cherries in it along with blueberries. mom's original banana bread recipe. Add dry ingredients to wet ingredients, mix till all are incorporated. Pour into two well-greased loaf pans or make muffins. Bake ar 350 for 45 to 60 minutes or until brown and middle is dry when tested with a toothpick. Very creative of Chad to want to combine favorite fruits into banana bread! Also, I see that the maraschino cherries were used instead of the regular-yum. No doubt this was a success. The bread looks moist and packed with fruit, which is very enticing. You and Chad make a great team in the kitchen! Innovative cooks and bakers run in your family. My boys are the cooks in their families, for the most part. I want to make this bread soon. I love all of the fruits and coconut. I got a new bread pan, which I need to christen. Beautiful bread…handsome son! Love his NY hat…that’s my team! Of course, this is the best. Look at what Chad added and maraschino cherries oh my. What a beautiful bread. I have to agree with the blueberry idea. I love blueberries in anything or just by themselves. Hi there! I made this bread with my daughter and we loved it! What a creative twist on traditional banana bread - we are having it again for Easter brunch. This looks great, Claudia. I love that your son is into cooking and baking too... his future wife will love it also hehe. Oooh coconut and blueberries, that sounds pretty darn amazing! What a great idea!! This bread sounds fantastic! Your son did good! This looks absolutely delicious for either breakfast or a light dessert. This is very creative. What a lovely son you have including your favorites in the bread as well. Looks delicious and I love the cherries added, I love it all. Great sweet guest post and your son is a doll.